There are a wide variety of room types available to students. Some room types are only available in certain locations and to certain academic classifications, and some are limited in numbers. Use the chart below to learn about the many different room types and communities on campus! If you have additional questions, please visit our website and take a look at each community’s floor plans to learn more about the set-up and configuration of each room type. For a complete list of room types and designations, review the Room Designation Sheet. To view floor plan layouts, room layouts, and our 3d floor plans visit this page. Triple Three students share one bedroom. These three students will share the bathroom with two other students in the adjoining suite (their suitemates). The beds will be lofted at no charge to the student. 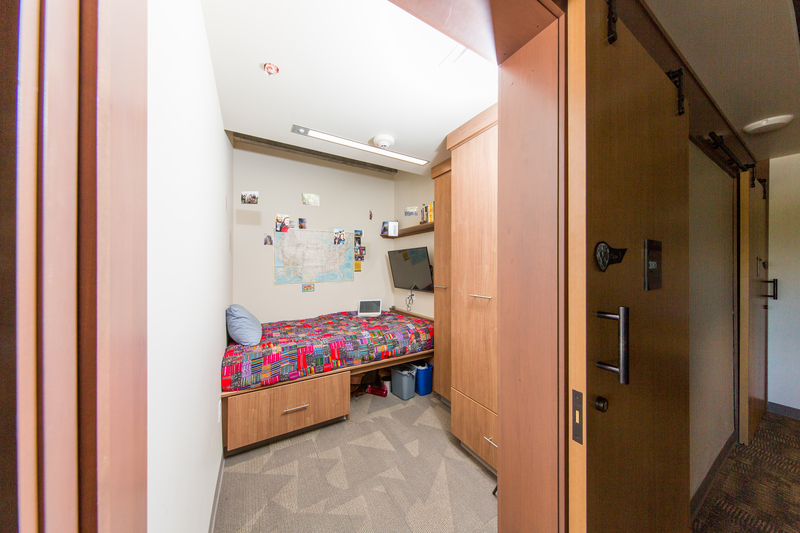 Each student will have their own bed, desk, chair, three-drawer dresser and shared wardrobe/closet. Example photos of a Triple can be viewed here. Double Two students will share one bedroom. These two students will share one bathroom with two other students in the adjoining suite. Each student will have their own bed, desk, chair, three-drawer dresser and shared wardrobe/closet. Economy Double Two students share one bedroom and one bathroom. The beds will either be bunked together or lofted at no charge to the student. Each student will have their own bed, desk, chair, three-drawer dresser and shared wardrobe/closet. Single One student has a private bedroom and shares the bathroom with one other suitemate. Starting in Fall 2018, students will share the suite with either one or four other suitemates (in Sage Point). Super Single One student has a private bedroom and bathroom. The student will have their own bed, desk, chair, three-drawer dresser and shared wardrobe/closet. These rooms are extremely limited. OC Double Deluxe Two students share a bedroom and share a community bathroom. There are multiple private use bathrooms in the house—two or three students to a bathroom. A kitchen and multiple living spaces (dining, living, studying) are also available in the house. 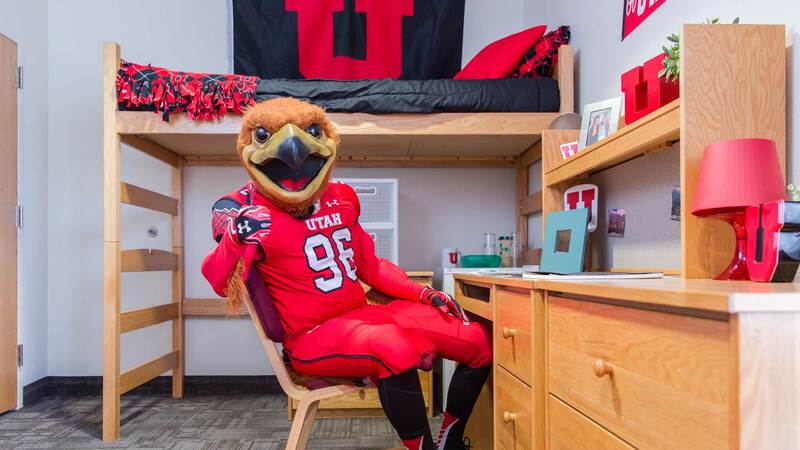 In the bedroom, each student will have their own bed, desk, chair, three-drawer dresser and shared wardrobe/closet. OC Single Deluxe One student has a private bedroom. There are multiple private use bathrooms in the house—two or three students to a bathroom. A kitchen and multiple living spaces (dining, living, studying) are also available in the house. In the bedroom, each student will have their own bed, desk, chair, three-drawer dresser and wardrobe/closet. OC Super Single One student has a private bedroom and a private bathroom. A kitchen and multiple living spaces (dining, living, studying) are also available in the house. In the bedroom, each student will have their own bed, desk, chair, three-drawer dresser and wardrobe/closet. These rooms are very limited. 2-Bedroom Two students share a kitchen, one bathroom, and furnished living space. Each student has a private bedroom. In the bedroom, each student will have their own bed, desk, chair, three-drawer dresser and wardrobe/closet. 3-Bedroom Three students share a kitchen, two bathrooms, and a furnished living space. Each student has a private bedroom. In the bedroom, each student will have their own bed, desk, chair, three-drawer dresser and wardrobe/closet. 4-Bedroom Four students share a kitchen, two bathrooms, and a furnished living space. Each student has a private bedroom. In the bedroom, each student will have their own bed, desk, chair, three-drawer dresser and wardrobe/closet. 4-Person Double Two students share a bedroom and bathroom. These students share a kitchen and furnished living space with two other students (their suitemates). In the bedroom, each student will have their own bed, desk, chair, three-drawer dresser and wardrobe/closet. 4-Person Single One student has a private bedroom. This student shares a bathroom with one suitemate. 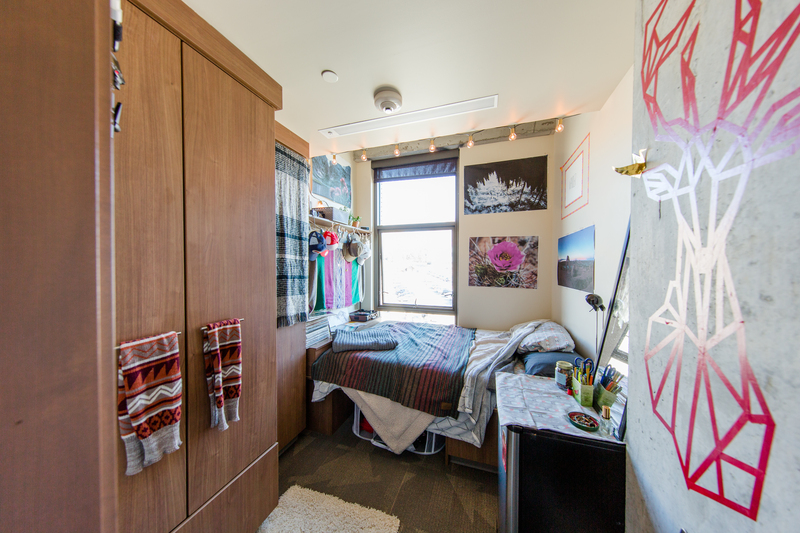 The kitchen and furnished living space are shared with three other students. In the bedroom, each student will have their own bed, desk, chair, three-drawer dresser and wardrobe/closet. In the bedroom, each student will have their own bed, desk, chair, three-drawer dresser and wardrobe/closet. 5-Person Single One student has a private bedroom. This student shares a bathroom with one suitemate. The kitchen and furnished living space are shared with four other students. In the bedroom, each student will have their own bed, desk, chair, three-drawer dresser and wardrobe/closet. 5-Person Triple Three students share a bedroom and a bathroom. These students share a kitchen and furnished living space with two other students. In the bedroom each student will have their own bed, desk, chair, three-drawer dresser and wardrobe/closet. To see photos of this room type, click here. 8-Person Double Two students share a bedroom and a bathroom. These students share a kitchen and furnished living space with six other students. In the bedroom, each student will have their own bed, desk, chair, three-drawer dresser and wardrobe/closet. 8-Person Single One student has a private bedroom. This student shares a bathroom with one suitemate. The kitchen and furnished living space are shared with seven other students. In the bedroom, each student will have their own bed, desk, chair, three-drawer dresser and wardrobe/closet. 2-Bedroom Apartment Two students share a kitchen, one bathroom, and a furnished living space. Each student has a private bedroom. In the bedroom, each student will have their own bed, desk, chair, three-drawer dresser and wardrobe/closet. Click here for photos. 3-Bedroom Apartment Three students share a kitchen, one bathroom, and a furnished living space. Each student has a private bedroom. In the bedroom, each student will have their own bed, desk, chair, three-drawer dresser and wardrobe/closet. Click here for photos. 2-Bedroom, Shared Four students share a kitchen, one bathroom, and a furnished living space. Two students share each bedroom. In the bedroom, each student will have their own bed, desk, chair, three-drawer dresser and shared wardrobe/closet. Click here for photos. 1-Bedroom One student has a kitchen, one bathroom, and a furnished living space. In the bedroom, the student will have their own bed, three-drawer dresser, and closet. Click here for photos. 2-Bedroom, Shared Two students share a kitchen, one bathroom, and a furnished living space. Each student has their own bedroom. In the bedroom, each student will have their own bed, three-drawer dresser, and closet. Click here for photos. 3-Bedroom, Shared Three students share a kitchen, one bathroom, and a furnished living space. Each student has their own bedroom. In the bedroom, each student will have their own bed, three-drawer dresser and closet. Click here for photos. Studio One student has a kitchen, outdoor deck, one bathroom, and a furnished bedroom/living area with a walk-in closet. Kitchen counter stools, a sectional, bed-frame and mattress, desk/nightstand and chair, and a three-dresser drawer are included. 1-Bedroom, Single One student has a kitchen, outdoor deck, one bathroom, a furnished bedroom with a walk-in closet, and living area. Kitchen counter stools, a sectional, bed-frame and mattress, desk/nightstand and chair, and a three-dresser drawer are included. 1-Bedroom, Double Two students share a furnished bedroom with a walk-in closet, living area, bathroom, kitchen, and deck. Each student will have their own bed-frame and mattress, desk/nightstand and chair, and a three-dresser drawer. Kitchen counter stools, and a sectional furnish the living space and kitchen. The walk-in closet will be shared in the 1, bedroom shared. 2- Bedroom, Single Each apartment includes a shared kitchen, private or shared bathrooms, and shared living room. One student has a private bedroom and bathroom. The kitchen, furnished living space, and deck are shared with either one or two other students depending on the apartment type (their suitemates). In the bedroom, each student will have their own bed-frame and mattress, desk/nightstand and chair, three-drawer dresser and walk-in closet. Kitchen counter stools, and a sectional furnish the living space and kitchen. 2- Bedroom, Double Two students share a bedroom and bathroom. These students share a kitchen, furnished living space, and deck with one other student (their suitemates). In the bedroom, each student will have their own bed-frame and mattress, desk/nightstand and chair, three-drawer dresser and walk-in closet. The walk-in closet may be shared. Cluster Double Two students share a room. Room sections share bathrooms, community kitchen, and additional work space. Each student will have their own bed, desk, chair, three-drawer dresser and wardrobe/closet. In Clusters, students share 10 individual bathrooms (one bathroom per three students) and each has access to a community kitchen. Cluster Single One student has a private room. Room sections share bathrooms, community kitchen, and additional work space. The student will have their own bed, desk, chair, three-drawer dresser and wardrobe/closet. In Clusters, students share 10 individual bathrooms (one bathroom per three students) and each has access to a community kitchen. Loft Three or four students will share a loft. Each loft is open space, except the private bathroom. The lofts have outfitted kitchens and furnished additional living/work space. The furniture is movable within the open loft unit. The bedroom in the loft is an open space for all four students. Pod Twenty students live in a pod community. Each student has a private living pod, which is furnished with a full-sized bed, built in storage and a flat screen TV. Each student also gets an additional storage locker outside of their pod. Some pods have windows, but some pods do not. Click here for a list of pods with windows and pods without windows. The pods are clustered around a generous amount of shared live and work space in the middle of the pod community. That space includes a large kitchen, dining area, work tables and several lounge areas. Each pod community has six bathrooms.